Heavy-duty construction-noise level be minimized. Power-saving. Material of crusher blade is made in Germany ; long blade life. Tangential Feed-the large cutting chamber with the powerful scissor rotor cutter, assures the smoothly operation and efficiency throughout. Feeding hopper remove by hydraulic-safety easy for clean and maintenance. Blow molding : PET bottle, PE bottle, PP bottle, PVC bottle and etc. Injection : 50 L Drum, pallet, tote, storage box, beer box, trash bin, bumper and etc. 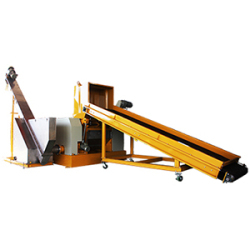 Extrusion : Lump, sheet, pipe and etc. Film : Agricultural film, bags, woven sacks, jumbo bags and etc. Thermoforming : Vacuum forming, pressure forming and etc. Roto molding : Large objects. Rubber : Tires and etc. Lumber : Woods and etc. Electronic supplies : Computer keyboard, computer shell, home appliances and etc.